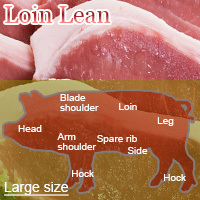 Lean pork loin is pig meat taken from the area between the shoulder of pig and their upper thigh. It is used to make pork saute. It is high in vitamin B1, vitamin B6, niacin, and potassium. It contains DGLA and 6 mg of adrenic acid docosatetraenoic acid abundant in the human brain. The calories in Pork Loin Lean per 100g(1cut ) is 150 calories. Pork Loin Lean is calculated to be 150Cal per 100 grams making 80Cal equivalent to 53.33g with 22.7g of mostly protein、5.6g of fat、0.3g of carbohydrates in 100g while being rich in vitamins and minerals such as Selenium and Vitamin B1.